Visit California - Travel Guide - Wine Country - State Parks and More. The state of California is the third largest in the United States, and it should come as no surprise it offers a vast plethora of vacation and activity opportunities. California stretches for over 840 miles along the U.S.’s west coast, offering an amazing array of climates, environments and natural beauty. California is home to giant Redwood Trees, the driest place in the US and even boasts some of the most magnificent mountain ranges within North America, combined with modern, vibrant cities and quaint wineries. For any type of traveler, California has a wonderful array of experiences and activities to enjoy. California’s unique geography creates a diverse range of terrain, ecosystems and environments. This state is home not only to the lowest, driest place in the country but also home to the highest mountain peak in the contiguous United States. For travelers looking to brave the dry, hot climate, Death Valley offers experiences that cannot be found elsewhere. This intriguing spot is an amazing 282 feet below sea level, and ironically is only 84 miles away from Mount Whitney, the highest point in the lower 48 states. Mount Whitney is located within the Sequoia National Park and has an elevation of 14,505 feet above sea level. Mount Whitney is not the only piece of nature’s majesty that this park offers- Sequoia is world famous for its giant Sequoia trees. The Sequoia trees in this park include General Sherman, the largest known tree on the planet. General Sherman stands at 275 feet tall and is believed to be approximately 2,500 years old. While Sequoia is in the South Sierra Nevada; the central, or High Sierra, offers majestic sights as well. Yosemite National Park is perhaps the most famous attraction in this area. This stunning park was made famous by the photography of Ansel Adams. In his surreal photographs, Adams was able to capture the incredible natural beauty and breathe taking terrain this park has to offer visitors. This park is also one of the most popular places for camping, backpacking and hiking on the west coast. In addition to these majestic national parks, California is also home to a vast array of state parks. With such a wide range of terrain and geography, this state also has more than 270 state parks that it administers. One of the state’s most famous parks is the Big Basin Redwoods State Park. This park is world famous for the incredible giant redwood trees located within it. In addition to the redwoods, the park supports a large variety of other tree species, along with varied wildlife. No matter what type of outdoor recreation is desired California delivers unmatched opportunities for fun. Not only does this state offer amazing state and national park, but the state also has over 840 miles of prime coastline along the Pacific Ocean. From surfing to fishing, the atmosphere available in this state cannot be matched elsewhere. For the travelers less inclined towards natural adventures, the state also offers a vast array of activities and sights that are not surrounded by forest. Central California got is claim to fame via one of its most valuable natural resources- gold. Gold Country encompasses parts of central to northern California. During the heyday of the Gold Rush in the 1800’s this area saw an incredible influx of prospectors looking to strike it rich and make a fortune on gold. 1849 was the peak of the California Gold Rush, and the immigrants were widely known as “49ers”. Sutter’s Mill in Coloma, California is cited as the place that gave birth to the California Gold Rush. When gold was found at this site, word quickly spread and over 300,000 people rushed to the area. By 1863 the rush was over and California was forever changed. As a result, this area of California is now home to numerous historic sites and “ghost towns”. As the influx of people abandoned the area, towns that sprung up overnight to support the miners became abandoned. Due the dry, warm climate many of these towns have weathered the passing years extremely well and are fascinating sites for modern travelers to visit. The area around Sutter’s Mill is host to a wide variety of historical markers, buildings, and landmarks. There is also a modern replica of the original building built on the site of the original mill. If more modern fun is sought, California offers urban experiences that simply cannot be replicated elsewhere. With its diverse population and landscape, California is home to some of the most intriguing, vibrant cities in North America. Among the gems California has to offer, the city of San Francisco is perhaps one of its most beloved cities. Located on the San Francisco Bay, this city is known for both its stunning Victorian architecture and its vast array of intriguing and exciting landmarks. 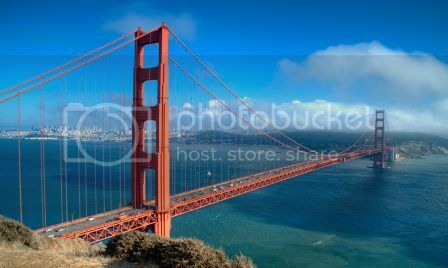 One of the most famous landmarks is the Golden Gate Bridge. This amazing suspension bridge has declared one of the “Modern Wonders of the World” by the American Society of Civil Engineers. This world famous landmark stretches 8,981 feet across the bay, connecting the northern tip of San Francisco to the Marin Headlands, gateway to the north coast. San Francisco is also known for its thick fog but on a clear day it is possible to view the infamous Alcatraz Island from the bridge. Referred to as “The Rock”, this island housed only the most dangerous criminals during its 29 years as a federal prison. Some of its notable “residents” included Mickey Cohen, Machine Gun Kelly, Robert Stroud, and even Al Capone himself. The prison was closed in 1963 and is now one of the biggest tourist draws in the region. Operated by the National Park Service, travelers can access the island via a ferry ride from Pier 33. Pier 33 is located in close proximity to Fisherman’s Wharf, another of this city’s most famous sites. At Fisherman’s Wharf, travelers can a wide variety of fun and nightlife. The Wharf is home to fine restaurants to wine and dine at with excellent views of the bay. In addition, local historic sites and museums add local flavor to the area. Another thing this city is well known for is its stunning Victorian architecture. The beautiful buildings and unique geography of this hilly city blend to create an atmosphere that simply cannot be found elsewhere. The city has been featured in a large range of movies and television series, and the Victorian houses found in this city are its most recognizable feature. In addition to the “rows of painted ladies,” San Francisco is also well known for its charming cable cars. These open air street cars offer a unique perspective to view the city from, and be sure to take the time to enjoy a cable car ride through this charming city. Although San Francisco may be the most visually recognizable city in California, it is not the largest city in the state. That title belongs to the bustling metropolis that comprises Los Angeles. This exciting city is the second largest city in the United States, trailing only behind New York in population. Travelers can easily access this area by booking a flight to the LAX airport and then renting a car. Los Angeles is such a large, diverse area it is nearly impossible to experience the area without the aid of an automobile, and rentals are easily and abundantly found at LAX airport. This modern city was first settled in 1771 by Franciscan missionaries and the name Los Angeles is Spanish for “the angels”. LA’s greatest claim to fame would have to be Hollywood. Hollywood is the American mecca for fame seekers and celebrity watchers. Nearby Beverly Hills is home to many stars and the super-rich and is well known for its famous palm tree lined streets and giant mansions. With posh hotels and five star resorts this area offers accommodations and activities that even the wealthiest travelers will enjoy. Upscale shoppers enjoy the world famous Rodeo Boulevard and often are treated to the excitement of a real celebrity sighting while perusing the world famous shops and boutiques. Los Angeles also offers nightlife like no other. Home to the world famous sunset strip, as well as thousands of clubs and bars, there is never a dull moment. Widely diverse crowds create a festive and welcoming atmosphere and offer fun until the sun comes back up. The western end of this region rests upon the sparkling Pacific Ocean. Well known for its beautiful beaches and deep blue waters, the Pacific is the ideal spot for family fun in the sun. Sea lions, otters and other marine life are common sights along the ocean shore as well, making exciting highlights for any beach trip. For the wine connoisseur, California has a wine country that rivals France itself. The beautiful Napa Valley is host to hundreds of vineyards and wineries. The temperate climate of this region creates a fantastic environment for grape vineyards. In fact, the Napa Valley is considered by many to be the top American viticulture area. Take time to attend a winery tour and attend a wine tasting- the results are sure to please. For accommodations, not only are there numerous hotels, but the area is also known for its quaint bed and breakfasts and numerous inns. Further south, along the Pacific Coast, is one of California’s most temperate and lovely cities. Located near the southern border of the state, this city is the 8th largest in the US, and the 2nd largest in California. With a pleasing, temperate climate, this city is truly a joy to visit year round. For animal lovers, San Diego is a fauna paradise. Home to the world famous San Diego Zoo, travelers can enjoy viewing a vast array of animals including the highly endangered Giant Panda. The zoo is well respected and has an outstanding reputation of being one of the most progressive zoos in the world and for providing excellent living conditions for all of its animal residents. In addition to the zoo, San Diego is host to many other fun, family centered activities. Legoland offers families a chance to enjoy life sized amusement park rides created from Lego bricks. Sea World San Diego provides a marine animal delight for visitors of all ages, and features shows with performing killer whales and other marine life. San Diego also serves as an important port for the cruise ship industry. The port here hosts upwards of 250 luxury cruise liners a year, and serves roughly half a million ship passengers a year as well. California is a unique and awe inspiring place to visit. No matter what experience is desired, California offers travelers unmatched opportunities for fun adventures sure to create fond, life long memories. From its stunning giant trees and high mountaintops to pristine views of the serene Pacific Ocean, California is the perfect destination for travelers of all types.